Sun Shipbuilding and Dry Dock Company published a 'Products and Services' book in 1946, that we call the Blue Book due to ithe color of it's cover. This book highlighted many of Sun Ship's technological advancements, World War II accomplishments, services to the oil and chemical industry as well as plant facilities. This addition to the website was in honor of Howard P. Wood Sr. by his son, Howard P. Wood Jr. who supplied a copy of the 'Blue Book' with a notation about his father on the inside cover. 'Woody' as he was known in Electrical Maintenance (33M) was a Power House Operator in the Central Yard Power House. Among the Power House Operator's responsibilities included the operation the Yard's 8 large Ingersoll-Rand 2400 volt air compressors that supplied between 2,000 and 4,000 CFM compressed air per unit at 90PSI throughout the Central Yard, two large 1,500KW motor-generators that supplied 250 volt direct current to the Central Yard's many bridge cranes and monitoring the Yard's electrical power distribution system that came into the Yard from what was then 'PECO' (Philadelphia Electric Co) at 13,800 VAC,then distributed throughout the Yard at various voltages. In addition, the Power House Operator was also responsible for sending thousands of employees off to work at the start of the shift, to-and-from lunch and finally off to home at the end of the shift. This was done by the Sun Ship whistle that was located in the Central Yard Power House. For decades, this whistle was manually operated by the Power House operators by pulling on a a long rope that was connected to the whistle that was 'powered' by the Yard's compressed air system. 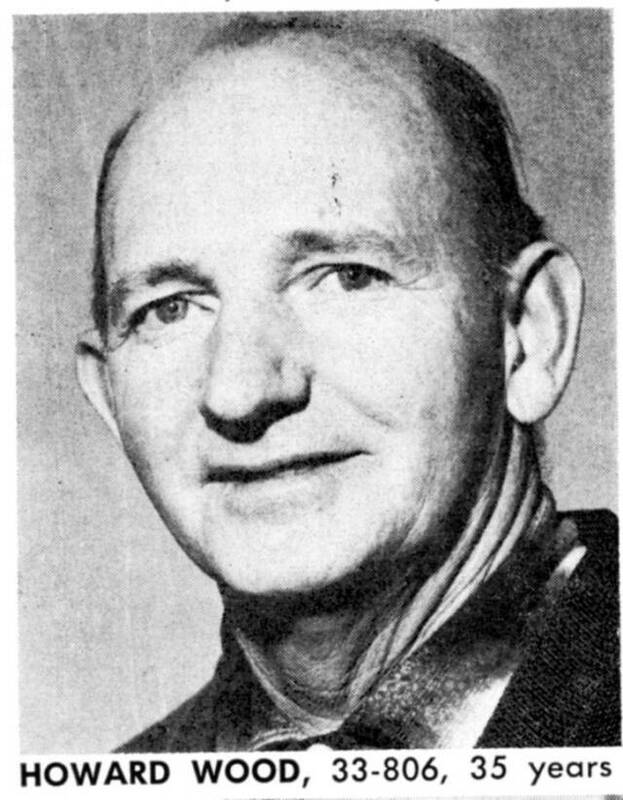 This is a photograph of Howard P. Wood Sr taken from the Our Yard magazine from Feb of 1965 at the receiving of his 35 year service pin. Howard was born on April 20, 1909 and died on August 21, 1986. He started at the Yard December 10, 1928 and retired on April 30, 1974, which would have given 'Woody' 45 years of service. This information was complied by his son, Howard P. Wood Jr.